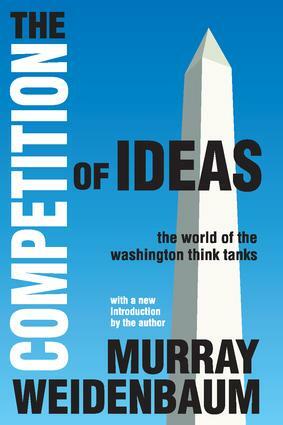 Murray Weidenbaum has been a visiting scholar at the American Enterprise Institute and the Center for Strategic and International Studies, a speaker at meetings at the Brookings Institution, the Cato Institute, and the Heritage Foundation and has also written for their publications, and served as a reviewer of ongoing studies. In The Competition of Ideas, Weidenbaum examines the political economy of these vital institutions, drawing heavily on several decades of involvement in their activities. He is uniquely able to see their accomplishments as well as their shortcomings.Because of the importance of the activities of their organizations, and their tax-exempt status, think tanks are held to a high standard. Weidenbaum shows that sometimes think tanks are more tank than think�major think tanks are often predictable in the positions they take on public issues and are far better at analyzing the shortcomings of other elements of society than of their own operations. The overarching issue of quality control, Weidenbaum holds, deserves more attention than it has attained in the think tank world.This book presents a careful, balanced account of where think tanks have been and where they are now headed. Given the high levels of professionalism in many think tanks, a fundamental change in the attitude of their management is important. The compelling need is less for the wielder of policy than for the lucid synthesizer of relevant research and analysis. Likewise, society needs sensitivity to the long-term concerns of the citizenry more urgently than rapid response to the opportunities of the moment. Future competition, particularly among the major think tanks, could well be centered, not on achieving greater visibility, but on developing responses to economic, environmental, and national security problems that are likely to be adopted and carried out.